The Masonic Certificates collection features Masonic certificates from the Van Gorden-Williams Library & Archives collection, spanning over three centuries. A Masonic certificate is a diploma issued by a Masonic body, such as a Grand Lodge, or a subordinate body under its authority, testifying that a member has been initiated as a Master Mason or other degree, such as the Royal Arch degree. A Master Mason certificate issued to Thomas Pool by Solomon’s Lodge, No. 1 (Poughkeepsie, N.Y.) and dated 1774. A Master Mason certificate issued by Seaview Lodge (Revere, Massachusetts) to John MacFarlane Murray and dated December 13, 1928. Imprint at bottom of certificate reads, "John A. Lowell Bank Note Co. Boston." 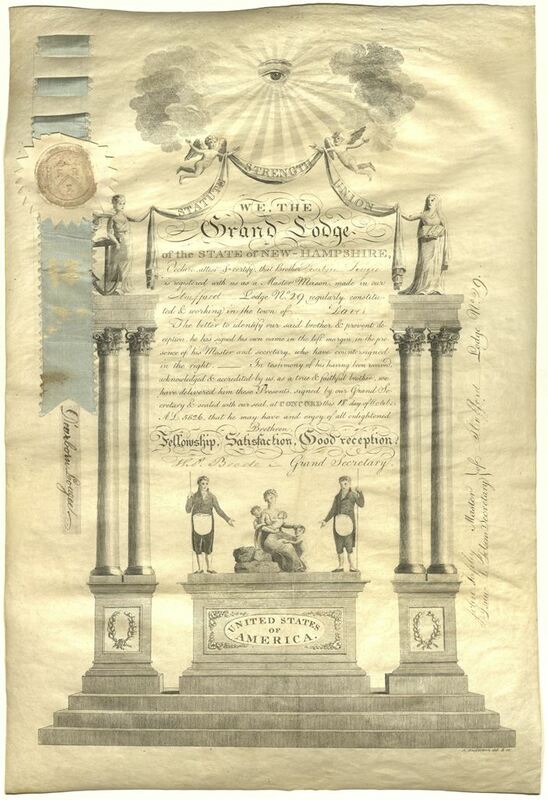 A Master Mason certificate issued by Union Lodge, No. 31 (New London, Connecticut) to Henry A. Mitchell and dated February 17, 1854. Imprint at bottom of certificate reads, "Engraved and Published by H. Goodwin, 2nd, Hartford, 1826."